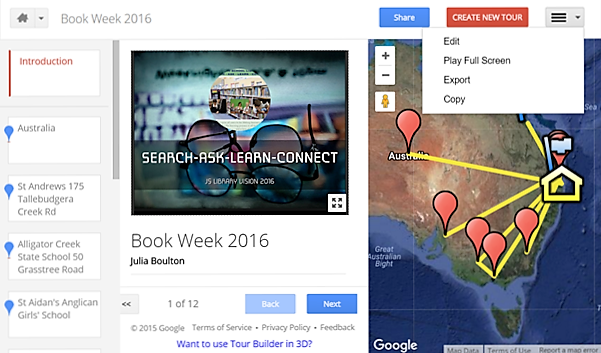 Tour School Libraries for Book Week. Welcome to Children’s Book Week. You are invited to tour school libraries and see what they are doing for Book Week this year and take a peek into their library. Various school libraries have added their details to the Google Form and these have been added to Google Tour Builder. Select the link below to view the tour in your web browser (select – Play Full Screen). Navigate using the navigation buttons at the bottom of the Google Tour webpage (use link above). Alternatively, you can download the KMZ file (for Google Earth) and play it there.